The daffodil season was here and gone so quickly, I barely noticed. Hot winds wilted the mid season bloomers and singed any flowers just opening. It was all a little rude, but you’ll have that when you garden on a hilltop and the weather decides to finally heat up. A few daffodils escaped the wind. Having too many helps in this regard. Fortunately I have way too many bulbs coming along, so even if a few are less than perfect there’s still plenty more where that came from. Narcissus ‘Conestoga’. You may notice the birch branches cut as holiday decorations last winter have found a new home as part of the parterre archway. The daffodils were missed, but to be honest I wasn’t all that in to them this spring. They’re overcrowded and in need of digging and replanting and as I thought about it this week I decided many will find their way to the compost pile this summer. As long as we’re being honest here I may have even filled a wheelbarrow with a few hundred ‘less favorite’ bulbs yesterday in an effort to speed up the process. As the daffodils fade the tulips take over. Although the heat brought the tulips on too fast and also fried many of the blooms, the color is still great. Don’t look too closely though, there are plenty of signs of Tulip Fire here as well. I’m sure there’s a lesson to be learned here. Maybe I shouldn’t just plant any bulb I can find… maybe I should be more faithful to the ones I have… maybe I’m not a good person to look to for tulip advice, since all you’ll learn here is that playing around with too many tulip bulbs might just leave you with a disease. I promised abstinence last summer, but by the time autumn rolled around there were again more tulips. Exotic parrots proved irresistible although these came up with a few fringed tulips mixed in. Fortunately I have enough space to let these things run their course. 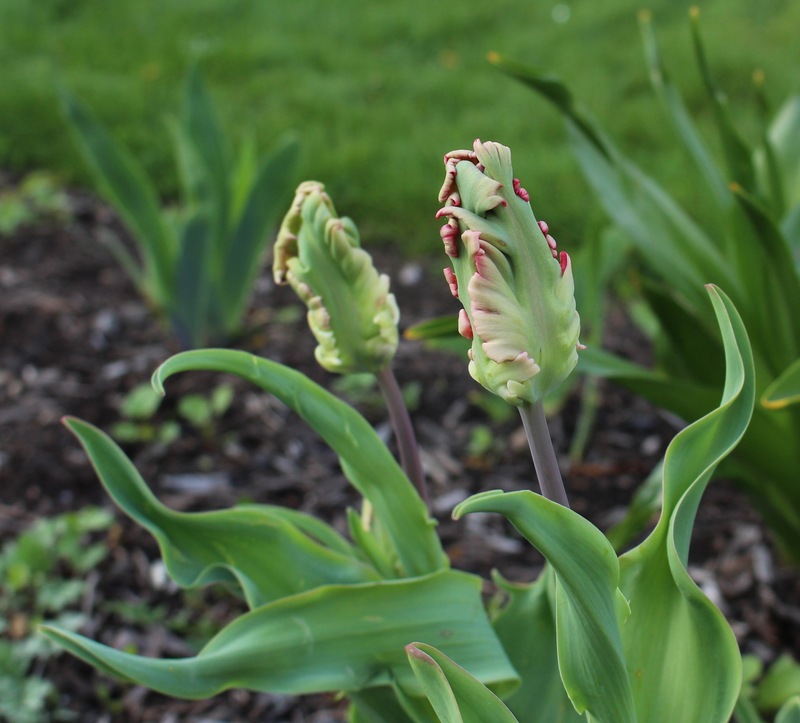 Tulip Fire (Botrytis tulipae) is specific to tulips and shouldn’t bother anything else, and between thinning crowded clumps and removing overly infected leaves, maybe I can control it somewhat without resorting to chemicals. Other parts of the garden still have plenty of the stray tulips which always seem to hitchhike in with the compost. The colors might be a mess but it makes me smile! Tulips in the front border. 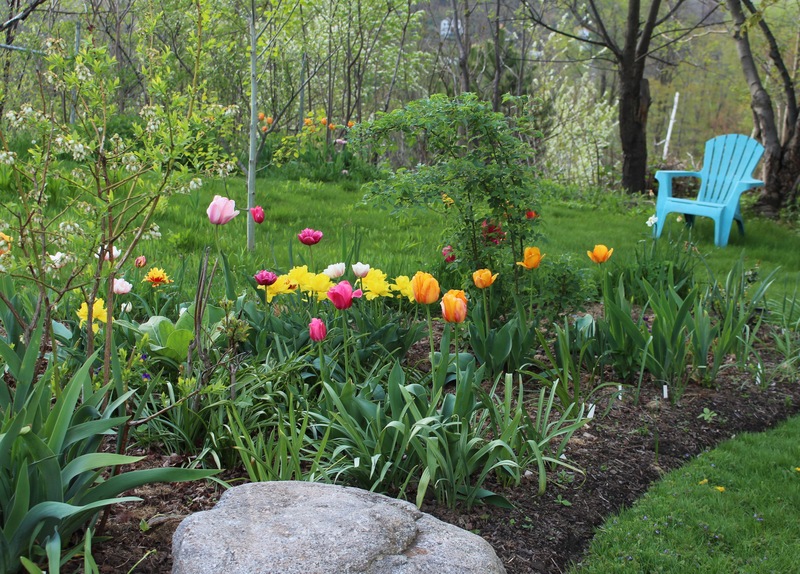 It’s perfect right now, the spring bulbs are up yet the weeds are still too small to notice. Ok one more issue. I noticed a few of the solid orange tulips have ‘broken’. 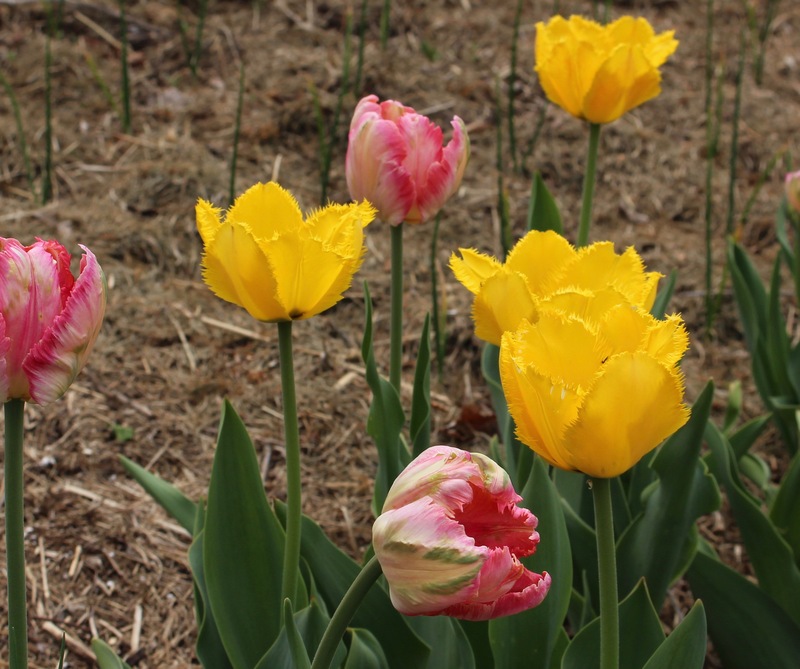 Broken color means the tulip has been infected with a tulip breaking virus which causes the color to streak. It’s the virus which brought on several of the most beautiful historical tulips ever, but it’s still a disease. I shouldn’t let them stay. For as pretty as it looks I don’t like the way it’s spread this year, and even if I don’t have a tulip growing livelihood to protect I think it’s time to do the right thing. Orange tulips streaked with flames of yellow. It wasn’t there last year and is likely a tulip breaking virus. All these problems are forgotten the minute I look at the next best thing. There are still late tulips on their way and I think they’ll be just as amazing… even if much fewer in number. The twisted fat buds of the last of the tulips, the parrots. We just had a “lively” thunderstorm barrel through and I wonder how the flowers made out with all the wind and rain. I’m hoping for the best but even if that’s not the case I noticed a few bearded iris nearly open. There’s always a next best thing at this time of year, but it still goes too fast. 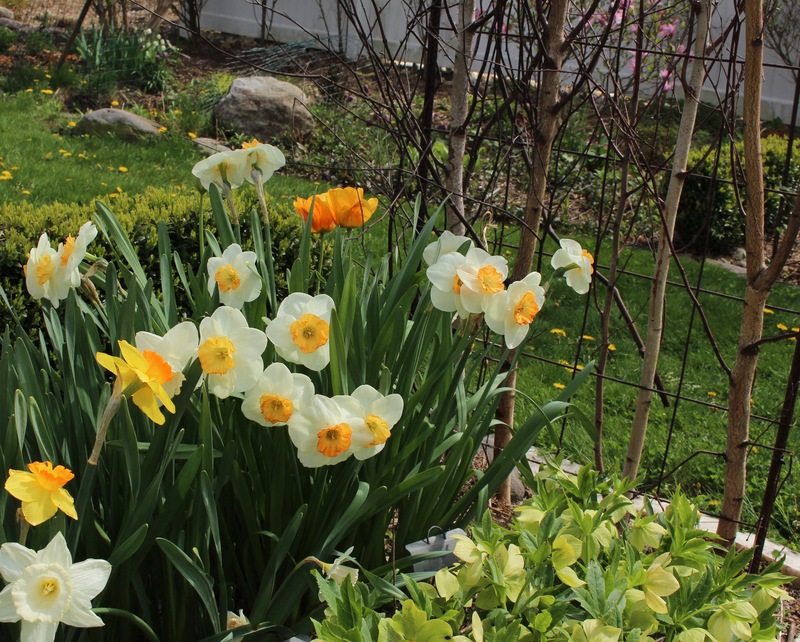 This entry was posted in daffodils, front border, mid spring, spring bulbs, tulips, Uncategorized and tagged daffodils, pennsylvania garden, spring, spring flowers, tulips. Such a gorgeous display, Frank! Thanks, but to be honest I was more impressed by yours! Tulips don’t seem to do well here. They bloom the first year and after that, just leaves. 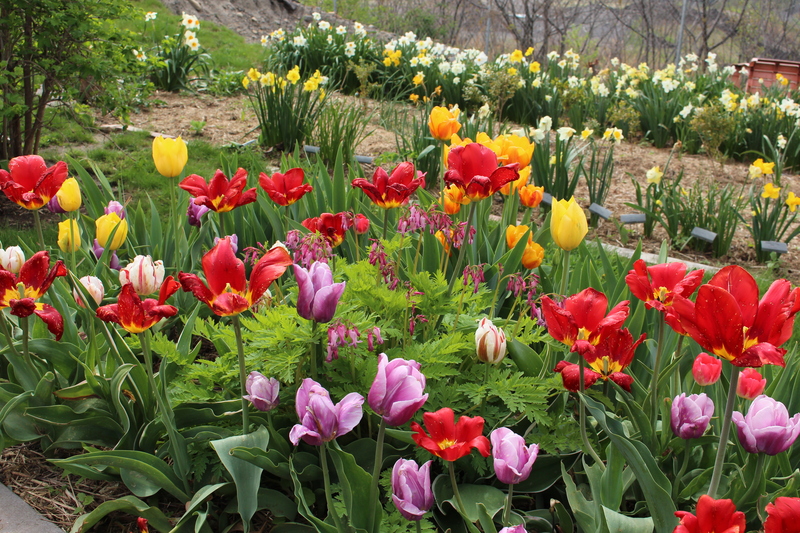 Your mess of tulips put on a colorful display despite all their diseases, fungus, wind and hail. Here we are having lots of wind too. No rain. My hellebores are laying down in a pout due to no rain. It is too early in the season for this to happen. Of course when it is 90F in May there is something wrong with this picture.Such is this gardeners lament. Oh no. 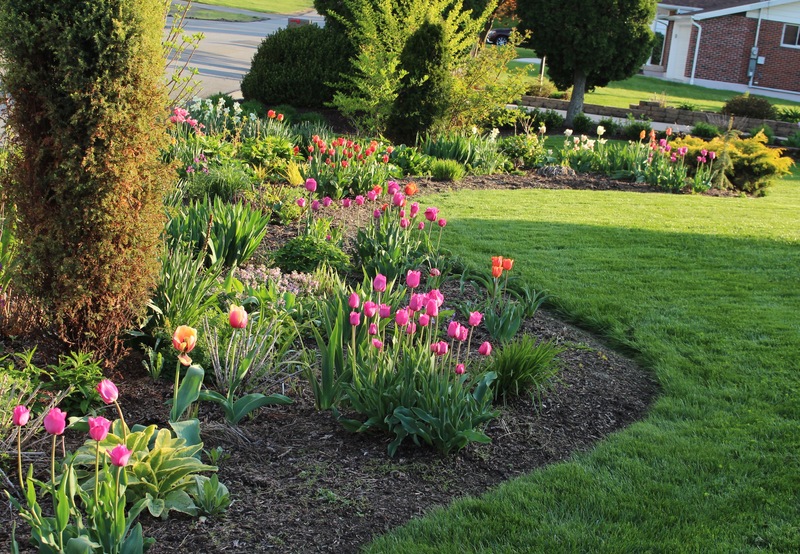 Drought in May is terrible, it’s one of the most discouraging thing to face as a gardener, especially after finally making it through the long winter. I hope you get rain soon. We had a spring like that a few years ago, but fortunately a wet June saved the year. My fingers are crossed you get a good soaking some time soon! Your bulbs certainly are glorious and that includes your narcissus. I can’t bear to think of some of them going onto your compost heap, surely your neighbours would love to have some? Your tulips are amazing, so envious as I can only grow them in pots, my soil is far too wet in the winter. They look beautiful to me. 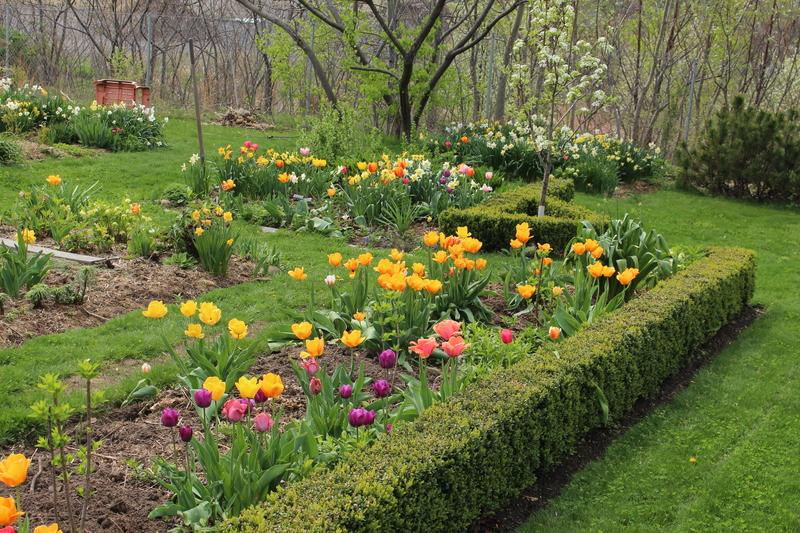 Thanks for the wonderful virtual tour of your garden. 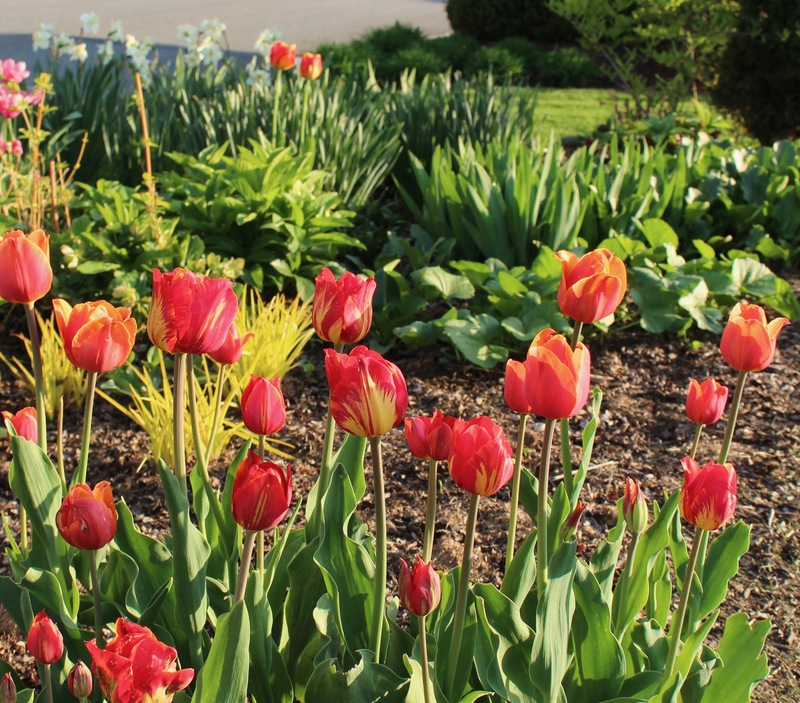 The tulips are glorious: love the color mix and different forms. You are a bulb master! Haha, coming from the another bulb master that’s quite the compliment! You may definitely claim glorious. The color break is gorgeous but you are probably smart to remove them. I like to say I have too many bulbs so that people think I recognize my problem and I’m trying to do something about it. Maybe they don’t notice as much when for every bulb I remove a dozen more just show up! It all looks great, diseased or not, Frank! The daff season was too short this year! It seems like all the earlies and lates bloomed at the same time, and then didn’t last as long as they should have! Boo! If you’re really looking to get rid of some narcissus bulbs, I’ll be happy to take them. I like to toss random daffs in small groups right at the edge of the woods bordering our lawn. My tulips are glorious right now, safely behind the vegetable garden fence! (No voles this year, yay!) It seems like they’re doing the same thing as the daffs, though, all blooming at once! Maybe I’ll write about them this weekend! Or maybe I won’t! Say no more. I’m starting a collection area for you as soon as the daffs start going dormant. 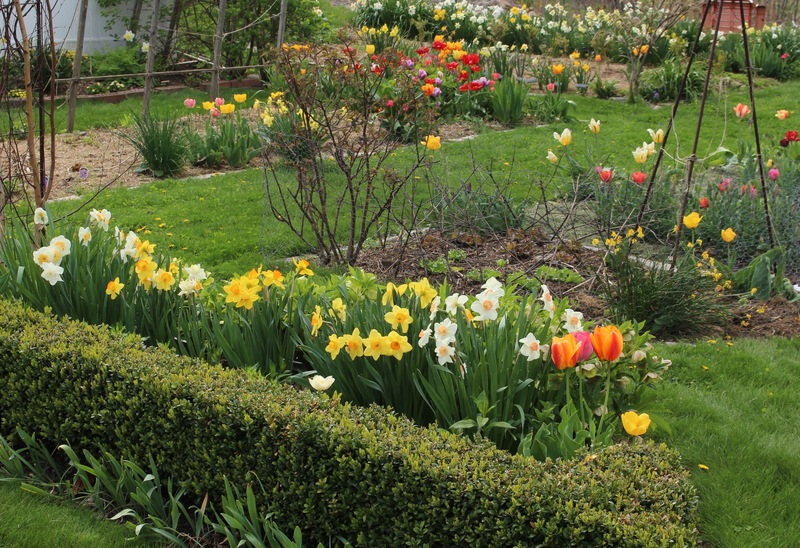 I’m already picturing waves of narcissus filling the back part of your garden! I hope your little chuck-lings haven’t mown down all the tulips. At least the voles gave you a break this spring! It does all go by so fast. Every day I try to relish each new thing, but it doesn’t make the time go any slower. Your garden is a delicious riot of color! I hated to hear that you are composting Narcissus when I can’t grow them except in the beds I irrigate in summer. The tulips look great. I like seeing them in mixed colour groups and drifts. That was one of the things that surprised me at Keukenhof. I hope you are able to post a few photos from your trip, but I bet you were far more focused on enjoying it! The scale of my narcissus problem is far worse than I like to admit. At one point I was well over 200 varieties, each starting innocently enough with anywhere from one to a small handful of bulbs. Many are now clumps of 30-100 bulbs, with numerous small offsets which no one wants to bother with. I’m glad you’re having a good Tulip year. They are gorgeous! 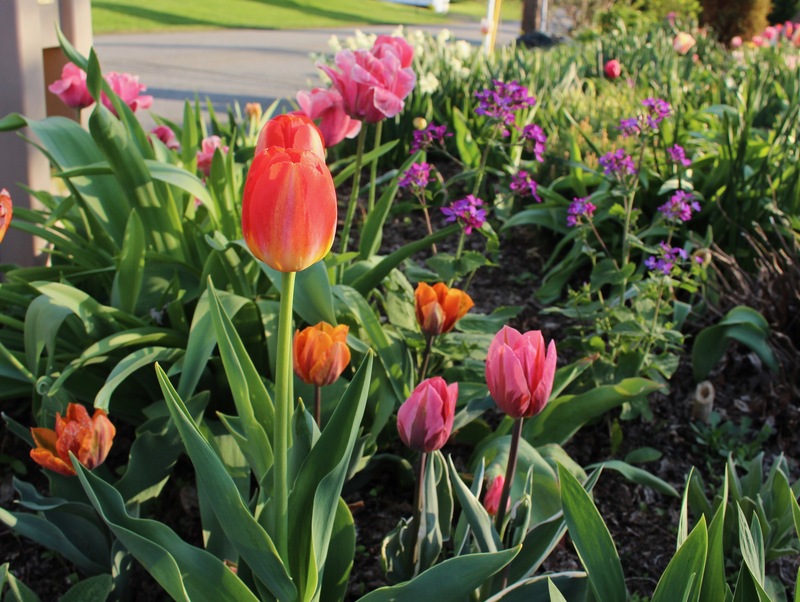 I agree that the Tulip season goes to fast – especially this year when most of the early tulips and late tulips are blooming at the same time! Yes, it looks great but when there’s an overwhelming avalanche of flowers all at once the danger of missing a few becomes a problem. Spring should start in February and last well into May, I think that would be an excellent solution. I see a rabbit or two every morning, apparently there are a plethora of tasty weeds which are much easier to find and eat!